Dennis McPhail's 1960 Ford Fairlane of Wellington, Kansas. Restyled by Hooligan Hot Rods and Jeff Myers the build was completed in 2010. Yaril Quintana's 1950 Ford Convertible was completed in January of 2011. The Juxtapod is a Swedish show rod built by Mattias Andersson of LeBeef Kustom Metal Works for Johan Belin and Ludvig Löfgren. The build was completed in March of 2011. The restoration of Dean Jeffries' 1956 Porsche 356 Carrera, as it appeared when it was featured on the cover of Rod & Custom October 1959, was completed in March of 2011. The restoration was performed by Jack Walter, who had owned the car since 1971. The Dreamster version of Kent Jonsson's 1934 Ford Roadster of Sweden made it's first public debut at the 2013 Custom Motor Show in Elmia in March. The car is made out of carbon and fiberglass, and total build time was 9 years. Miikka Salminen's 1936 Dodge Coupe of Finland. Miikka's coupe was restyled by Miikka and Hersti AutoShop, and the build was completed in 2013. Bo Huff's 1936 Ford Tudor Slantback Sedan owned and restyled by Bo Huff of Bo Huff Customs in Dragertown, Utah. The car, named "Corene", was completed in 2013. John D'Agostino's 1940 Cadillac Seriec 62 Coupe, of Discovery Bay, California was restyled by Oz Kustoms. The build, named "Sophia", made its debut at the 2013 Grand National Roadster Show. Timo Hersti's 1941 Lincoln Zephyr of Tuusula, Finland. The coupe was restyled by Timo at his Hersti AutoShop. He completed the build early in 2013, and it made it's first public debut at the 2013 Custom Motor Show in Elmia, Sweden. Palle Johansen's 1947 Cadillac Convertible of Denmark. The first version of the car was completed in 2013, featuring a padded top by David Martinez of Martinez Industries. Erik Lind's 1950 Chevrolet of Livermore, California. Erik's Chevrolet was completed in 2013. Kelly & Mark Skipper's 1951 Ford Victoria - The Royal Victoria of Fresno, California was finished in January 2013. Nick Rogers' 1951 Mercury was restyled by Matt Townsend at Townsends Customs & Hot Rods and Bill Ganahl at South City Rod & Custom. The build was completed in 2013, making its debut at the 2013 Grand National Roadster Show. Yaril Quintana's 1959 Buick Four-Door Hardtop of Hialeah, Florida. Yaril, who runs Yaril's Customs, is planning to have the car all done by the end of September 2013. Jeff Bruns' 1959 Ford of Vacaville, California. Named "Green With Envy," Jeff's Ford was completed in 2013. Johan Eriksson's 1964 Ford Galaxie 500 of Nyköping, Sweden. Johan is a founding member of the Undertakers of Sweden car club, and the restyled version of his Galaxie, featuring a panel paint job, hit the streets during the spring of 2013. Kevan Sledge's 1940 Mercury coupe of Martinez, California. Restyled by Kevan, the build was started in 2002 and completed in 2014. Lloyd Myers' 1949 Mercury convertible of San Jose, California. Lloyd was a member of the San Jose Rod and Wheelers car club. The Merc was completed in 1959. 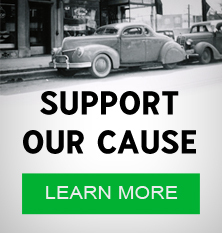 In April of 2014 Gary Wise of Olympia, Washington completed the restoration of the car. Janne Lundell's 1941 Lincoln Zephyr Coupe of Umeå, Sweden. The Zephyr was originally built by Timo Hersti at Hersti Auto Shop in Tuusula, Finland. Janne bought it in June of 2013, and during the winter of 2013 - 2014 he gave it a Deep Espresso Brown Metallic paint job. After painting the car, Ludde named it "The Carnelian Zaphir." Ron Barbarino's 1941 Plymouth Business Coupe of Concord, North Carolina. The build was completed in September of 2014, and it made it's first public appearance at the first Customs by the Sea car show in Wildwood, New Jersey in October of 2014. The Mulholland Speedster is coach built roadster by Hollywood Hot Rods. 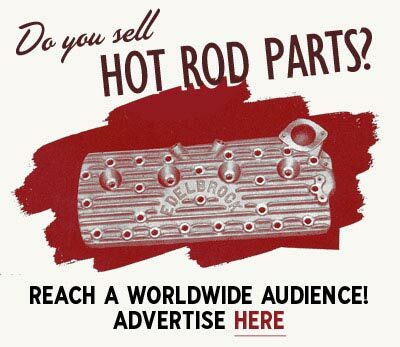 A bare metal version of the car was shown at the 66th annual Grand National Roadster Show in January of 2015. James Hetfield's Aquarius is a coachbuilt custom built by Rick Dore Kustoms. The build made it's first public appearance in January of 2015, at the 66th annual Grand National Roadster Show in Pomona, California. Adam Woodhams' 1959 Buick LeSabre of San Jose, California. The build, known as "the Lone Wolf", was completed in 2015. Roger Trawick's 1962 Buick Electra, the Electracutioner, of Yorba Linda, California. Roger is a member of the Beatniks car club, and his Buick was restyled by fellow Beatniks member David Hitchinson. The build was completed in 2015. Marcy Molkenthen's 1963 Buick Riviera XII was restyled by River City Speed & Custom. The build was completed in 2015, and it made its first public appearance at the 66th annual Grand National Roadster Show in January of 2015. John D'Agostino's 1968 Buick Riviera of Discovery Bay, California. Restyled by Oz Kustoms, D'Agostino's Riviera, named "The Pantheon", made it's first public appearance at the 2015 Grand National Rooadster Show in January of 2015. 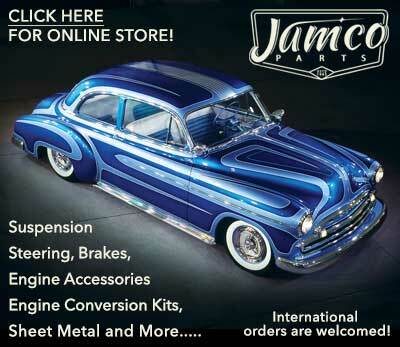 Jeremy Minamyer's 1949 Mercury of Concord, North Carolina. A white primered version of Jeremy's Mercury made it's first public appearance at the 2nd annual Customs by the Sea car show in Wildwood, New Jersey in 2015. Allan Winward's 1936 Ford 5-Window Coupe of Salt Lake City, Utah. Built by Allan, the build, known as "Miss Scarlet," was started in 2010 and completed in January of 2016. Allan is a members of the Salt Lake City Throttlers car club. Glen McElroy's 1937 Ford Roadster. Named "After Shock," the car was built by Rick Dore Kustoms. The build was completed in 2016. Scott Roberts' 1954 Mercury of Moorpark, California. The build was completed in January of 2016, just in time for the Grand National Roadster Show. John D'Agostino's 1958 Packard Sportster of Discovery Bay, California. Named "Rita", the two seater was built as a tribute to Hollywood movie actress Rita Hayworth. It was designed by John D'Agostino and OZ Welch. Body and paint was performed by OZ Kustoms in Oroville, California. The build made its debut at the Rodeo Drive Concours in Beverly Hills on Fathers Day 2016. Larry Grobe's 1954 Kaiser of Schaumburg, Illinois. Named the VooDoo Sahara, Larry's radical custom was inspired by the Barris Kustoms built Golden Sahara. The build was started in November of 2014 and completed in 2016. It made its debut at the 2016 KKOA Leadsled Spectacular in Salina, Kansas. Josie Celeste's 1957 Chevrolet Bel Air of Oakland, California. Named "Angel Lust," the panel painted version of Josie's Chevrolet was completed in 2016. Brandon Penserini's 1936 Ford roadster of Napa, California. Named "Venus," the roadster was built by Brandon at Altissimo Custom Paint & Restoration. The build was completed in January of 2017, and it made its first public appearance at the 2017 Grand National Roadster Show. Bruce Wanta's 1936 Packard Roadster of Bellevue, Washington. Named the Mulholland Speedster, Bruce's roadster was built by Troy Ladd and his crew at Hollywood Hot Rods. The build was completed in 2017, and it made its debut at the 2017 Grand National Roadster Show, where it won the prestigious America's Most Beautiful Roadster award. Thomas Pendelton's 1940 Mercury Coupe. Thomas' Merc was restyled by Kevan Sledge at Sledge Customs. The build was completed in 2017. Jack Kiely's Tucker 48 fiberglass replica. Built by Rob Ida and his crew at IDA Automotive, the build was completed in October of 2017. Jeff Spence's 1961 Plymouth Fury of Willits, California. Named "The Milky Way," Jeff's Plymouth was restyled by Jeff at Kustoms by Spence. The brown and gold version of the car made its debut at the 2017 Sacramento Autorama. The restored version of Eddie Dye's 1929 Ford Model A Roadster was debuted at the 2018 Grand National Roadster Show in January of 2018. The Menges Twin's 1940 Dodge Coupe of Santa Rosa, California. In 2018 the Dodge received a glossy black paint job. George Garcia's 1958 Ford Ranchero of Bellflower, California. George's Ranchero was built as a tribute to Richard Lee Tiago's 1957 Ford Ranchero, according to him the best custom Ranchero ever built. The build was completed in 2018. Jim "Bones" Noteboom's Ford Econoline. Restyled by Keith Dean at South End Kustoms, the build will make its debut at the Hippy Killer Hoedown show in April of 2018. Henrik Forss' 1966 Oldsmobile Dynamic 88 of Sacramento, California. The build was completed in October of 2018, featuring a panel and flame custom paint job by Kyle Martin of Martin Kolor & Style. 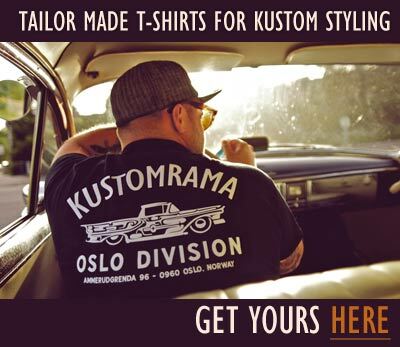 Subscribe to our newsletter and receive updates on 2010s and other subjects featured on Kustomrama. If you have additional information, photos, feedback or corrections about 2010s, please get in touch with Kustomrama at: mail@kustomrama.com.